Today seems like a perfectly fine day in Cancun to stick my feet into some lace-up boots that are strapped to a short surf-style board. Then, I’m thinking about having a high-performance jet ski, attached to aforementioned board by a tube that forces the ocean’s water through it, tow me around the sea and possibly hoist me a story off the water. I have always been a fan of The Jetsons futuristic cartoons, secretly fantasizing about being the daughter Judy and taking my flying space car to Orbit High School. 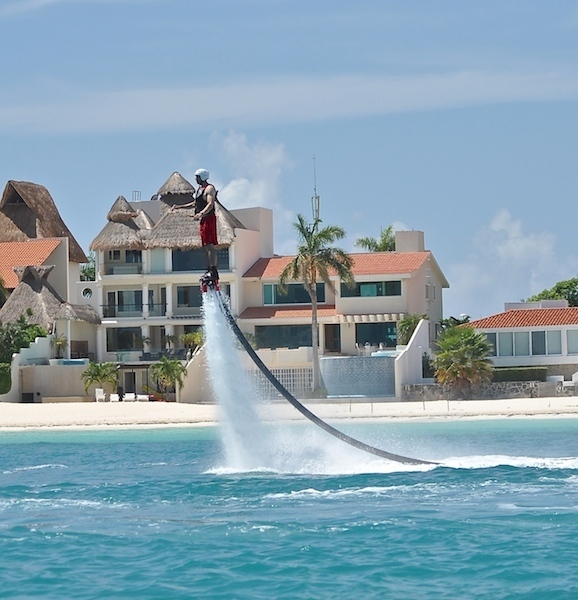 Flyboarding seems to be the closet thing to making my Jetsons fantasy a reality. Plus, it would be a great addition to my list of the top things to do before you die. When we arrived, we headed straight for the water where they attached our feet into boots that were attached to a board, much like a snow board. A tube was attached from our feet to the jet ski, this is what would be propelling us into the air. We were then given safety helmets which were equipped with speakers inside so the jet ski operator could coach us during our flight. I was just grateful to have my head protected by something. We were then warned, “You will fall, but try to dive into the water when you do. Don’t do a side belly flop.” It actually wasn’t until my last fall that I was actually able to execute that gracefully. We started the adventure by getting in a superman position with our bellies facing the water, a position I was familiar with because of zip lining in the Costa Rican rain forest. Then we were instructed to keep our legs straight and try not to fall. Sounds easy enough. When my very patient instructor Alex told me to get ready, I went from the standard superman position to pointing my legs straight down towards the bottom of the ocean. He was controlling the throttle, therefore controlling my height in the air. As my legs became vertical with the water, the throttle got louder and I was pushed into the air. That lasted a half a second until I tipped over sideways back into the water. “Remember to keep your legs straight, Annette.” I heard through my speakered helmet. Got it. The second attempt lasted three quarters of a second. “Don’t give up Annette.” He doesn’t know me that well, I’m not a quitter, though this scheduled twenty minute ride was beginning to seem really long. The third, fourth and fifth attempts looked the same as the first. It wasn’t pretty. Then, towards the end of my twenty minute lesson, something clicked. I used my yoga skills to find a focus point on land. Balance was key in this tricky extreme water sport and I found it…for about five seconds. Meanwhile, the husband found found his balance in about half the time and was able to go twice as high. Damn him. After my session the instructor reminded me that this is a sport, which takes time to learn and perfect. Maybe next time I will be doing impressive flyboarding tricks. Maybe. Either way, It turned out to be a great addition to my list of the top things to do before you die. haha! That looks amazing, and I have honestly never heard of it before! Will have to give it a go if I ever make it to Cancun! Amazing Stunts in water.I have never seen before.Mind Blowing Absolutely. Wow… It was too great. Flyboarding is an amazing fun to do, but I must say Jet boat Gold Coast is also great fun to experience. I recently have tried it and I am gonna try it once more very soon. 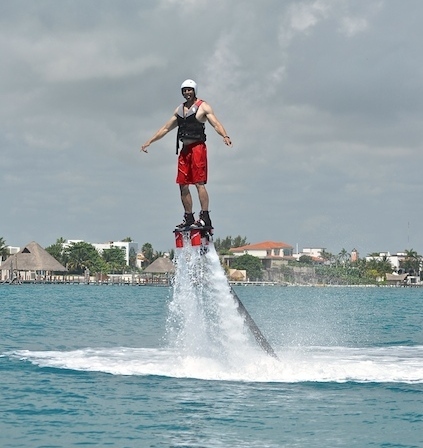 Flyboarding definitely deserves a high spot on my bucket list. It seems really fun. 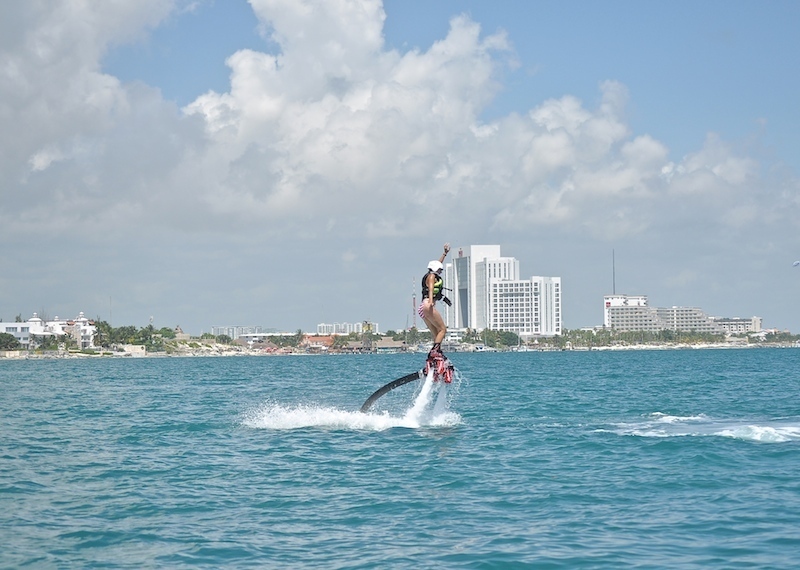 Hopefully, next time I travel, it will be to somewhere with flyboarding!